How to get there: The city of Asheville, northwest in North Carolina, is a good starting point. Asheville is located on Interstate 40, with Interstate 26 coming from the south. Follow signs for Blue Ridge Parkway going north-east. 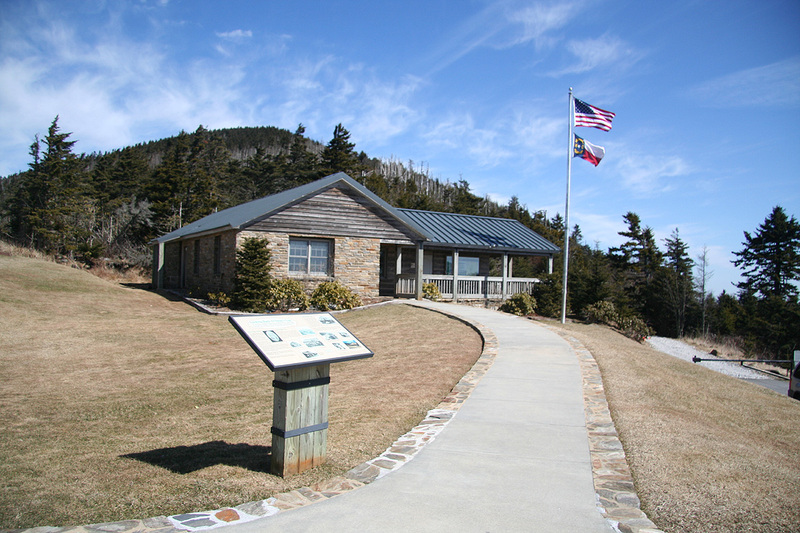 Look for Mount Mitchell State Park and make a left turn. Alternatively (since this section of the road was closed when I visited), go east to the small village of Marion, then take Hwy. 80 north. This road will intersect the Blue Ridge Parkway north-east of Mount Mitchell, so make a left and drive to Mount Mitchell State Park, making a right turn. In either case, drive a few kilometer uphill and park at the State Park Visitor Center, on your right hand side just as the road makes the saddle. This is a good trailhead, location N35:44.730, W082:16.651, elevation 1857 meter. One can drive almost to the summit, however, a short hike makes the visit much nicer. 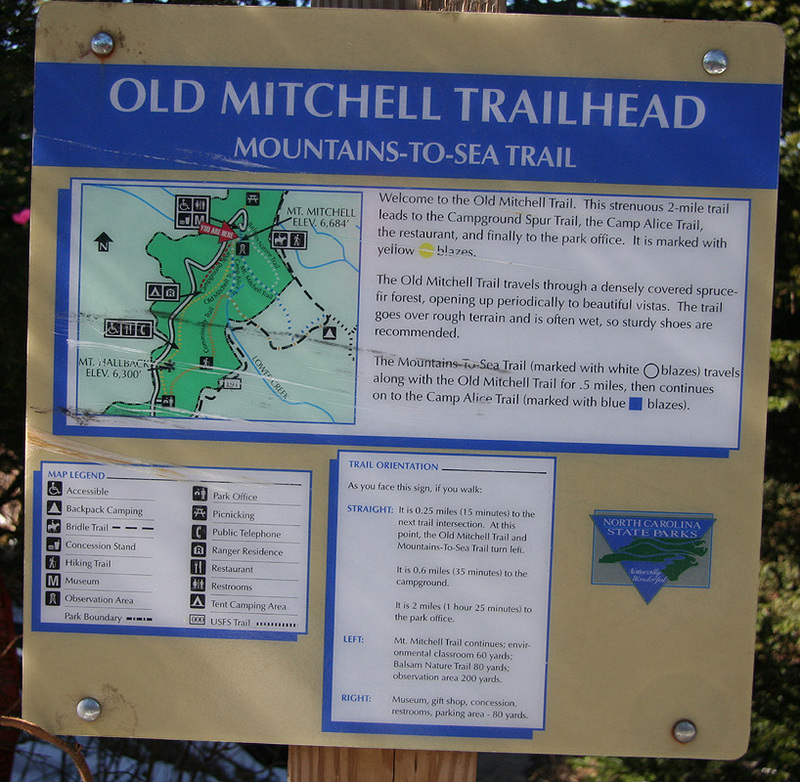 Route description: From the trailhead, follow the clearly marked trail to the summit. 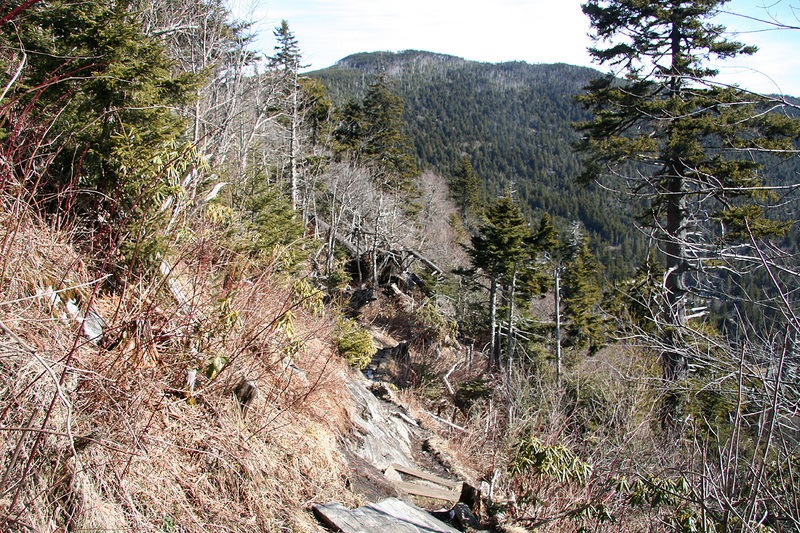 The trail partly climbs, partly contours across two hills before arriving at the final slope to Mount Mitchell. After passing the first hill, you cross near some buildings and the road is also just to your left side. Further along, the trail forks. This fork is clearly marked with a sign. Make a sharp left turn here and proceed to the summit. One may return the same way, or walk along the road. If one drives to the end of the road, this hike is reduced to a total length of only a few hundred meter. Comments: I had arrived in Tennessee after a very successful week in Colorado, productive work at the Colorado School of Mines, staying with good friends and a finishing off with a long, but good climb of Bison Peak in The Lost Creek Wilderness. I started from Oak Ridge in the morning. The Blue Ridge Parkway was closed by a rock slide between Asheville and Mount Mitchell. Thus a slight detour via Marion and then Hwy. 80 north was required. I left the trailhead at 1045 and arrived at the summit by 1130. 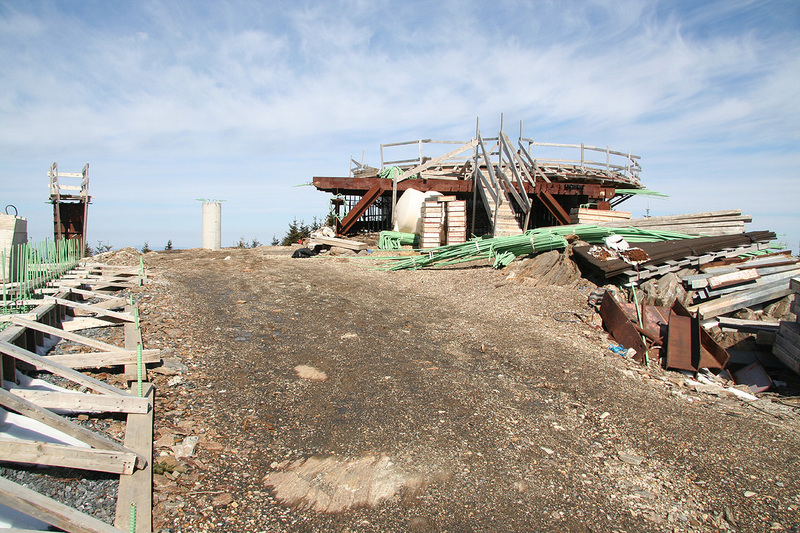 The place looked really messy, work to make some kind of viewing platform was clearly in progress. I rested and looked around, then descended at 1145, making it back to the car by 1220. I drove by here along the Blue Ridge Parkway in the summer of 1993. We visited Clingmans Dome, however may have passed by Mount Mitchell. The summit, hopefully this area will improve. 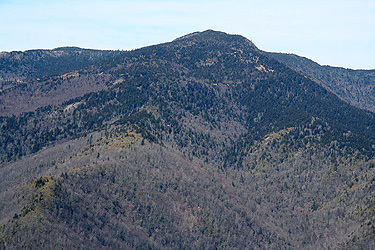 Mount Mitchell, as seen from The Blue Ridge Parkway. The highest point is right of center.